Coming into the 2017 season, the Tech football roster was primarily comprised of relatively young players a few years away from considering the NFL leap and veterans who knew that the last game of the season would mark the end of their football careers. Three players were noted as potential professional level talents — Lawrence Austin, Lance Austin and Ricky Jeune — but not one of the three made the 336-man roster of players invited to the 2018 combine. The Jackets are not exactly known for being a modern hotspot for NFL talent under the triple option offense, with less than two dozen Jackets drafted in the decade since Paul Johnson arrived, eight making it in the top three rounds. Still, with programs like West Georgia and Georgia State both getting a player into Lucas Oil Stadium for a closer look from scouts, one begins to wonder what it is that held Tech seniors back from getting a nod to this prestigious event. On the offensive side of the ball, the vast majority of the plays were executed by the first year starting tandem of junior TaQuon Marshall and sophomore KirVonte Benson. Marshall’s QB runs netted over a third of Tech’s offensive plays on the year and Benson’s rushing attempts only trailed Marshall’s by less than 50; senior J.J. Green only got a paltry 24 total touches on the year, good for sixth most on the team. Despite hauling in four TDs with two on the ground and two in the air, when the 380 all-purpose yards accumulated in two years at Tech is over 100 yards less than what he put up his freshman year alone at UGA, even a practice squad bid would be very fortunate. On the off chance that Marshall decided to pass, his favorite target by a long shot was Ricky Jeune with 39 percent more receptions and 2 more receiving TDs than the rest of the team combined. Jeune’s reliability makes him an interesting prospect; he has snagged 25 catches in 11 games every year at Tech. While his season yardage took a slight dip in 2016 due to the increased production from juniors Brad Stewart and Clinton Lynch, their yardage came crashing back down in 2017 and Jeune had remained the model of consistency, good for over 400 yards year after year. 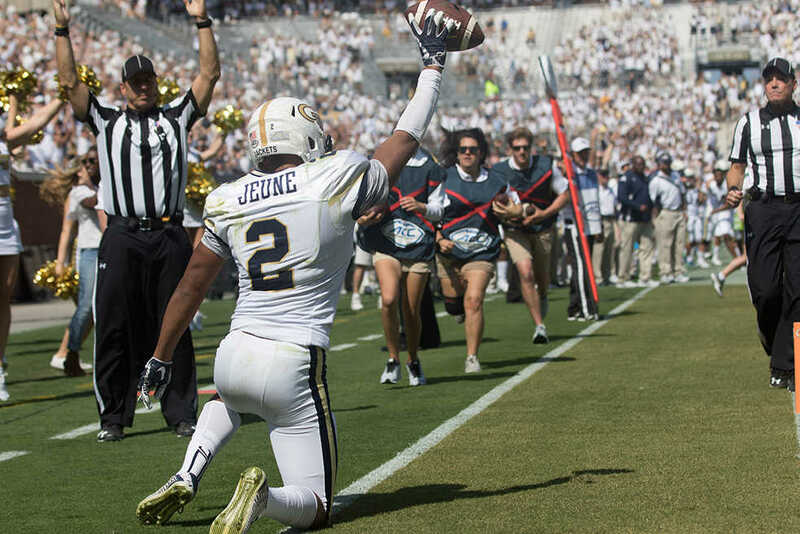 Jeune may not have gotten an invite to the combine this year, but Paul Johnson told the Atlanta Journal-Constitution last November that he believed Jeune would get a training camp invite from someone, a chance to prove himself at the professional level. Food for thought: the last Tech receiver to lead the team in touchdowns for 3 straight seasons? All-time great Calvin Johnson. In terms of defensive playmakers, senior defensive edge Keshaun Freeman was relegated from 2016 starter to 2017 rotational reserve, and with only 22 tackles and 10 solo on the year, the production numbers just simply are not there to merit a combine visit, especially on a defense rocked by pretty much every in-conference opponent with a .500 or better win percentage for the entire year. The same goes for fellow lineman Antonio Simmons, who also made an appearance in every game on the season but did not rack up the counting stats that would make him a standout. The secondary featured three notable seniors that will be leaving without a combine bid: the Austin twins and cornerback Step Durham. The three players only combined for three turnovers on the season with two interceptions and a fumble, but more importantly, not one of them had more than five passes defended. Tech’s porous defense was certainly more susceptible to the run than to the pass, but thanks to Ted Roof’s ultimately fatal strategy of giving opposing slot WRs five yards of cushion to operate, there were far too many short routes that carved up Tech’s defense to highlight any preventative athleticism in the secondary.